This second article of palm oil is discussing its data since year 2011 to 2015. Data included Export of Palm Oil, Country which imported Malaysia’s Palm Oil and CPO (Crude Palm Oil) price. So data is divided into three main parts, and then each of the part will consists of data which compare year 2014 and 2015. I also explaining the important point of each data only, the simple is the best. Hope everyone is understood the flow of the data because it will be easier to match understanding on my data. · Head part of the year is low export. · Tail part of the year is high export. · Year 2013 is the highest export. · Uptrend since year 2008 to 2011 (MPOC website latest data started from year 2008). · October always the highest export. · February always the lowest export. · Feb is the worst month. · Export uptrend continuously since May. 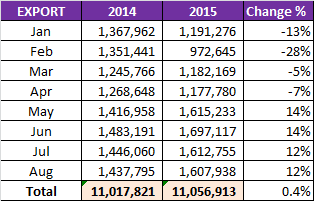 · No stable trend on the total export to top seven countries. · EU (European Union) always uptrends. · Import palm oil of China decreased approximately 29% from 2011 to 2014. · Import palm oil of India increased 93% from 2011 to 2014. · India is the country most need palm oil, followed by China and EU. · Pakistan and USA decreased their import . · Philippines and India increased their import. 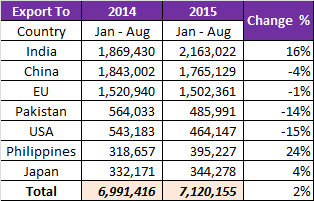 · Total export to top seven countries is increased slightly. · Monthly average price of CPO is decreasing since 2011. · August 2015 recorded the lowest CPO price since 2011. · Head of year is verified high CPO price. · Tail of year is noted low CPO price. · Theory of low export, high CPO price applied. · Year 2015 is worst year. · Feb 2015 to May 2015 reduced extremely when compared with corresponding month. · Theory of palm oil versus CPO price failed applied on year 2014. 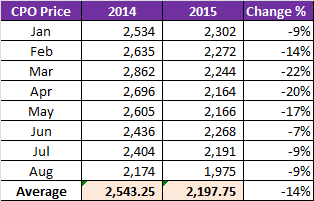 · CPO price in 2014 lower than 2013 even its export is lower than 2013. I am confident for the export of palm oil in future few months for this year. Data shows the tail of year always pass up the attractive result in each year, so the result in this end of year will be get better than last year and come to be the total export being uptrend in this year. Additionally, the point for each of the data above mentioned is useful for us to pick the plantation stock. I personally prefer to buy in month which the CPO price is low because the “Mr. Market” always sensitive to the CPO price. As the low CPO price caused by high export so September and October maybe a good pick. Here I attached a 20 years CPO price chart. From chart, we can see there are present of identical movement during year 1997 to 1999 and year 2006 to 2008. Both 1997 and 2007 happened Asian Financial Crisis and Global Financial Crisis respectively. Here exist one point again, CPO price going high during financial crisis. By the way, here is the question: “When is the date for financial crisis in future?” Moreover, chart also shows there is downtrend started from year 2010 until today. In the end, when is the rebound of this downtrend? My answer is “maybe soon” but that is impossible for us to forecast its future exactly because we are not the “Mr. Market”.